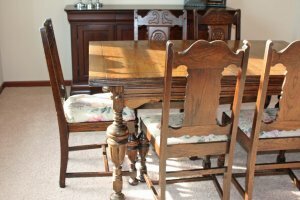 Families have been gathering around the dining room table for centuries. In many, if not most, families; dinner time is the one part of the day when the whole family can actually spend any time together. The significance of the dining room and its table should not be overlooked. Although the number of families that take the time to actually sit and eat together each night is dwindling, this gathering of family around a table covered in food is part of the glue that holds families together. Some people even theorize that more families sitting down to eat together on a regular basis could be enough to affect serious change on our society. Either way, for a proper dining room experience you need a table on which to dine. 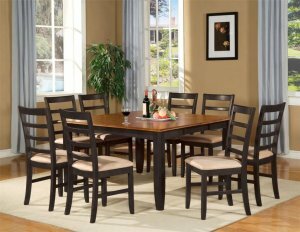 There are a lot of factors that go into choosing the right dining room table. The first and most obvious choices you will need to make are the shape and size of your table. Once you have the size and shape down you can start to delve into the fun details like the style and look of the table. Also there are special tables that might be a great choice for your needs. Technically speaking, there are a lot of different shapes that you can choose from for your dining room table. The ever popular rectangle, the longer rectangle, the oval, the elongated oval, the cool and fun circular table, or the edgy square shaped bar table. They make octagon tables, hexagon tables, triangle tables, and all sorts of tables in strange varieties of geometric shapes. But when it comes down to picking a shape for your dining room table, the only two shape choices that really matter are Rectangle or Circle. 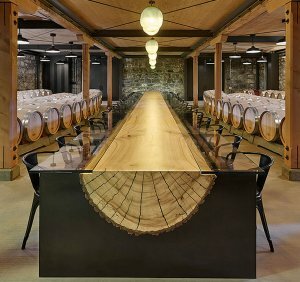 Nearly all the other shapes that were mentioned resemble a rectangle or a circle in that they either have a head and foot of the table with seats lining either side or they offer a shape that places guests roughly facing each other at equal distance from the center of the table. The former is the more traditional style that has been popular for hosting large groups of people for centuries while the latter is designed to foster intimacy and stimulate conversation. 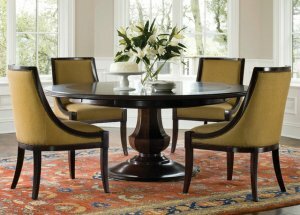 Keeping this in mind, the rectangle or other elongated tables work very well for traditional formal dining rooms. They are practically necessary for big family gatherings like Thanksgiving where you may have 10 to 20 people eating. A nice feature of rectangle tables is their ability to be pushed flat against a wall and used as a buffet table. This is not nearly as effective with a round table. Round or circular table and other non-elongated tables make it very easy to have conversations with everyone around the table and not just the people adjacent to you. The shape of your dining room table can really affect the kinds of dinners you have. The size of your dining room table is as important as the shape. The two choices go hand and hand. You will want your table to be able to seat enough people comfortably. You can easily fit 6 people around a small 60 inch by 30 inch table to play a board game or poker but the moment you need to make place settings you will be hard pressed to fit any more than 4 people around that table. You should also think about if you want a table big enough to fit all the serving dishes on the table with the place settings. Of course the biggest factor in choosing the size and shape of your dining room table is the size and layout of your dining room. You will want to look at where the doors are located and think about the likely traffic flow as people move in and out of the room with pots and pans filled with food. Once you know the orientation of the table within the room you can measure from the walls to give yourself adequate walking room behind the chairs. (The desired walking space may vary depending on your families’ girth) If it makes it easier you can lay out a sheet or just about any object to on the floor to help visualize the table and its size in relation to you and the room. 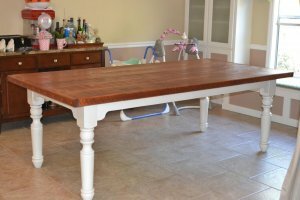 Once you have a good idea of the size and shape you want for your dining room table, you can then start deciding on all the other cool options available to you. Many dining room tables have a series of extensions called leaves that can be inserted to add length to the table when you have extra company. These extendable tables are one of the easiest ways to solve any space/size issues you may be struggling with. Most extendable tables are made to add one or two leaves but some tables are made to extend out to double in size. Another way to cheat with size and shape is to have a Gateleg table. These tables are similar to extendable tables in that they have adjustable size but rather than using removable leaves that are placed in the middle of the table, they manage their transformation via folding leaves that fold into place when needed or down in a less cumbersome vertical position when not in use. Here you can see a very cool Ikea gateleg table that takes this concept to an extreme. The table legs are important things to think about as well. Generally a table has four corners and a leg at each corner. While this is a very stable design, the corner legs can get in the way as people are trying to get in and out of their seats. 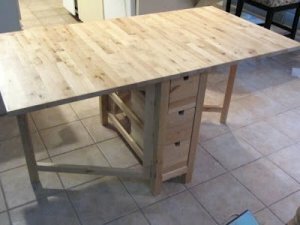 Some tables have what is called a pedestal base. This is when the table is supported by a central column or set of columns in the center. The column will usually come to an array of “feet” at the bottom. This design can offer a wonderful amount of access to those sitting on or near the corners. Both the corner leg design and the pedestal design are have a lot of advantages. 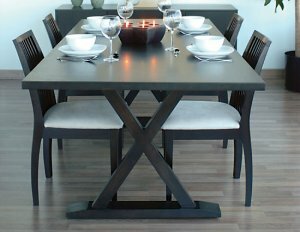 Some dining tables have 4 legs but do not use the four corner design. This table seen here has a bit of a picnic style table. 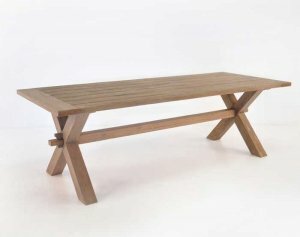 Tables of this design are sturdy and the legs do not get in the way often. However some people will not always like the look associated with the tables found in public parks. Many dining tables will experiment with various heights. The average table height is about 30 inches. This pub height dining room table brings the tabletop up about a foot. 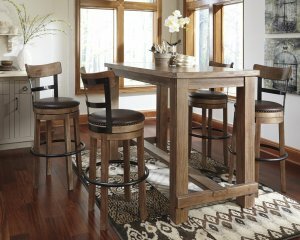 Pub height tables are typically around 40 to 43 inches tall. 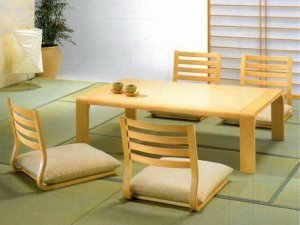 This low Japanese style dining room table goes the other way. It is designed for you to use while sitting on the floor or very nearly on the floor. Here you can see a round dining room table. These tables are the perfect way to use the table top Lazy Susan. The Lazy Susan is one of mankind’s greatest developments. and all you have to work with is your dining room then maybe you can make it work with this pool table that turns into a dining room table. 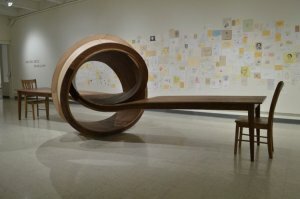 Here are two tables that were made with very artistic statements in mind. There are a lot of schools of thought out there regarding your dining room table. 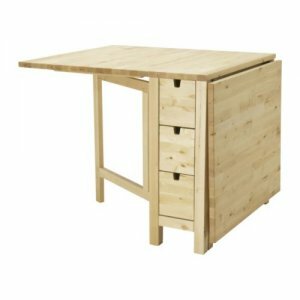 If you are looking for a new table to bring together all the aspect of the dining room, then hopefully this will be helpful.